Begonias bloom from late spring until fall. They thrive in partially shaded areas of the garden where few other flowers grow well. 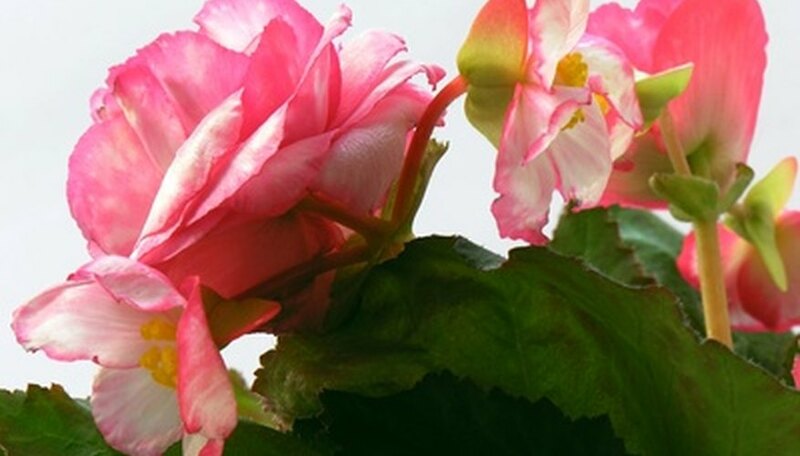 Tender perennials, tuberous begonias must be stored indoors during the winter months as they do not tolerate frost. Plant begonias in pots for the entire summer season or to get a jump start on flowering before transplanting them outdoors. The potted begonia can be started indoors in early spring so they are already blooming when you set the pots outside after the last spring frost. Fill a planting tray with vermiculite or another soil-less, sterile potting medium. Use seedling flats or a shallow cardboard box. Plant each begonia tuber in the vermiculite, setting the tuber so the side with the depression is facing upward. Plant the tubers so they are just covered with the potting medium. Space tubers 2 to 3 inches apart in the tray. Water the potting medium just enough to moisten it, taking care not to get water into the depressions on the tubers as this can cause rot. Set the tray in a 70 F room in indirect sunlight and continue to water as necessary to keep the soil moist. Transplant the tubers to a 5 inch diameter pot once the stems are 1 inch tall. Fill the pot with a moist potting soil, leaving a 1 inch space between the top of the pot and the top of the soil. Plant one tuber per pot, planting it at the same depth it was in the tray. Place in a brightly lit area and water as needed to keep the soil moist. Pinch off the very tip of each growing stem when it is 3 inches tall. This encourages full, lush growth and prevents legginess. The begonias can be set outside in their permanent location for the summer once all frost danger is past. If a late season frost is predicted, bring the pots in until the temperatures warm up again. Tuberous begonia are attractive in hanging baskets. Pinch the stems often to maintain the plant's shape and full appearance in the basket. Do not attempt to cut apart the tubers to divide them as you would other tuberous rooted plants. Begonias cannot be divided in this way.